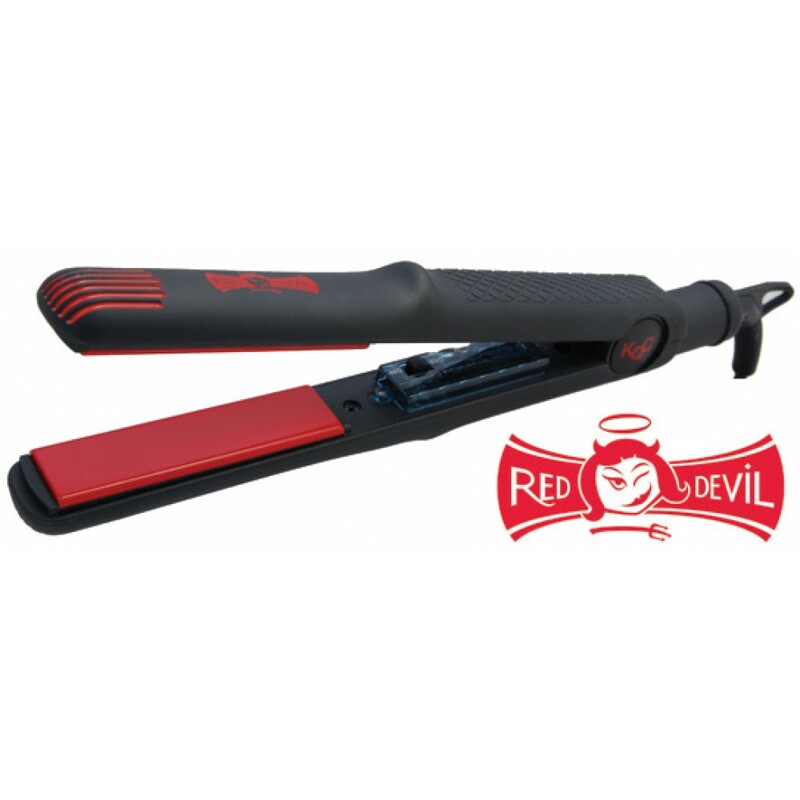 KQC introduces Red Devil, a fun and easy to use iron to straighten, flip or curl your hair. Red Devil comes with a special blend of tourmaline - ceramic. This unique combination leads to natural properties that result in the powerful natural emission of ions and far-infrared heat upon being crushed and heated. It helps seal the hair cuticle as the hair is styled - repelling humidity and static for incredible lasting frizz-free shine. Ceramic Technology - Ceramic Flat Iron plates are able to distribute heat across the entire surface evenly, retains heat more efficiently, and eliminates damaging hot spots. Ceramic plates radiates far-infrared heat to preserve more moisture within the hair shaft and causes less damage to the hair cuticle. It also emits negative ions, which eliminate static electricity and deliver shinier and sleeker results. Ionic Technology - Negative ions break water molecule clusters into micro-fine particles and penetrate the hair shaft, leaving the hair moister and less brittle. The result is smooth, silky hair with exceptional shine. Tourmaline gemstone crystals, which are a natural source of negative ions and far-infrared heat, are infused into the plate surfaces to create beautiful styles with less damage and result in healthy, shiny, beautiful hair. Tourmaline - Pure precious gem stone crystals. Tourmaline is a natural source of negative ions and far infrared heat. Negative ions eliminates frizz and close the cuticle to create smooth, shiny hair. Far infrared heat penetrates hair from within, resulting in faster styling with less damage. Always start from the lowest heat setting and increase the heat as needed for your hair type and texture. Lower heat setting are recommended for fine or damaged hair. Higher heat setting are for difficult to manage thick hair. Wonderful!! 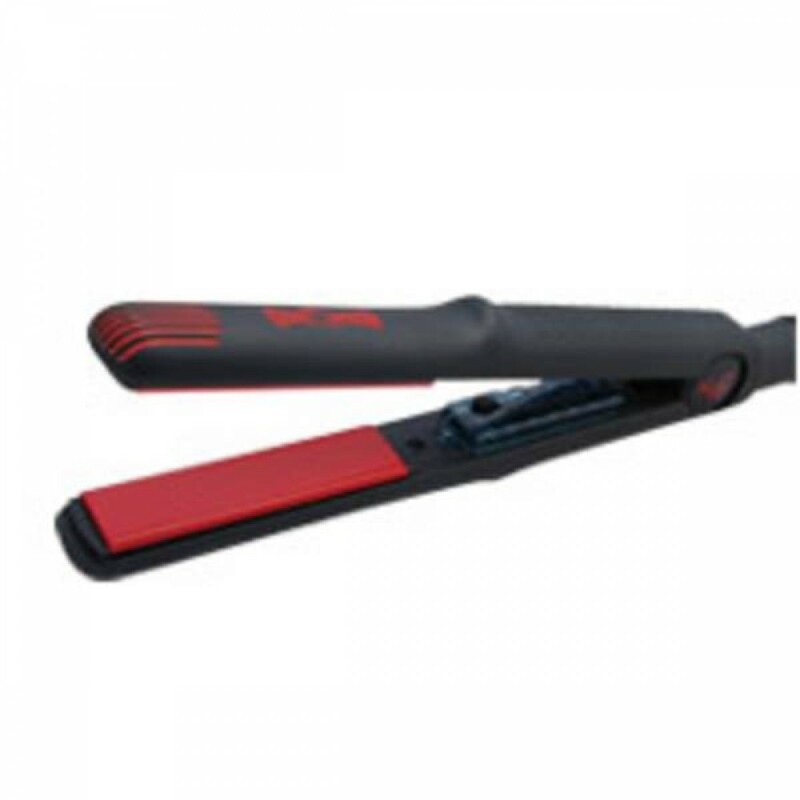 Review by Alyssa G.
Works Wonderfully Review by Suzanne M.
I'm so happy with this flat iron! I have long, wavy, thick hair, and lots of it.. I've only used drug store brand straighteners in the past which on average took me over an hour with multiple passes to style my hair. The cheap brand seemed to do more harm than good because sometimes it still didnt get my hair as straight as i wanted and was very damaging. The red devil had my hair looking PERFECT in about 15 mins. The temperature control is also great because i can use it on the lowest setting for the bleached and more damaged sections of my hair and turn it up for the healthier dark layer on the bottom. What i love the most is that my hair stays straight, i put it in an elastic for work, sleep on it, and the next day it still looks great without the big crease and waves. Used it with the KQC heat protector spray which was an awesome gift and my hair feels so soft! I'm in love this little devil was worth every penny. I have a typical Asian hair which is already jet-black shiny straight hair. We normally want something we don't have; as for me, I've always wanted a thicker and slightly wavy hair. After seeing some hair tutorials at youtube (Rosebud143) using KQC, I was SOLD! I absolutely LOVE, LOVE, LOVE the Red Devil KQC Flat Iron. I honestly do not know the difference between X-HEAT and RED DEVIL but the Red Devil works wonders on my hair! I've only used curling irons before and it always leaves my hair flat 2-3hrs later. The KQC flat iron- leaves my curls intact even the following day!